While the hands of his dying victim grasp at his bloody robes, a ronin or masterless samurai raises the lantern with his gory hand. You can't see it in this print, but Gengobei's bloody right hand is holding a sword in the left-hand panel of the triptych from which this is the center panel. 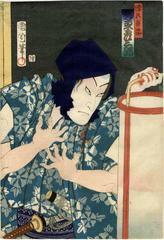 This print commemorates a performance at the Nakamura Morita Theater in 9/1868. There is another image of Gengobei, a magnificent image, in the Lyon Collection, but this one was drawn by Toyokuni I 67 years earlier. See #208.